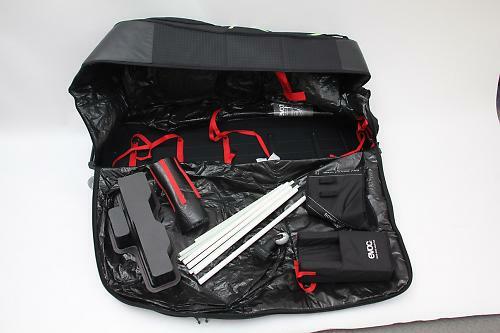 The Evoc Bike Travel Bag Pro is lightweight, packs down well and protects your bike while travelling by plane, train or automobile. 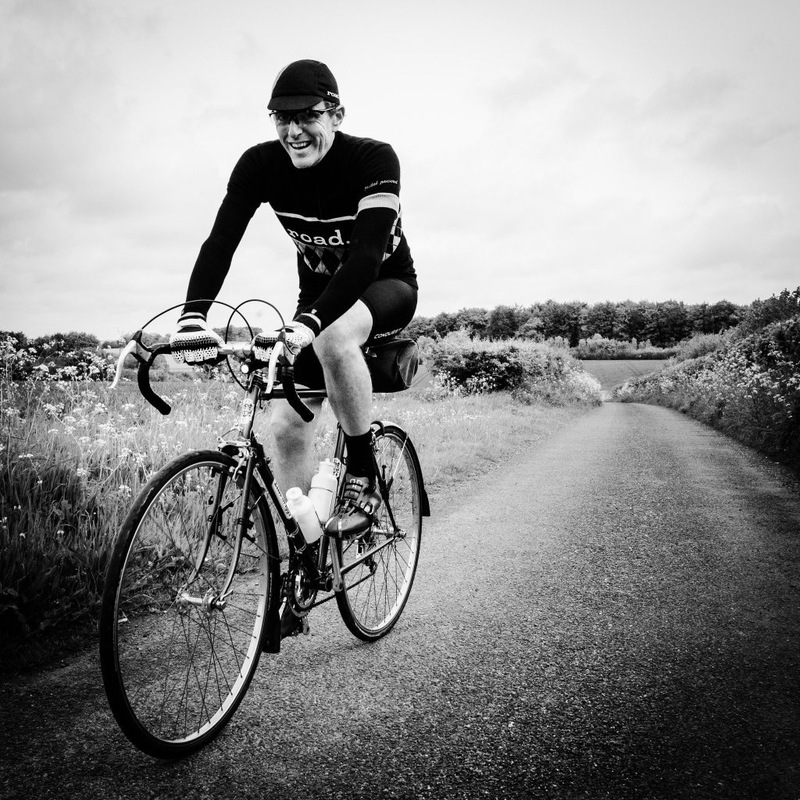 Choosing to take your bike with you when travelling has many advantages: you know exactly what you're going to ride, it's set up perfectly for you, and there's no downtime collecting, adjusting and returning a hire bike – or hire cost either. And now that many airlines consider bikes acceptable luggage, you might not even have to pay any fee for flying with it. Bike cases fall into two types: hard and soft. 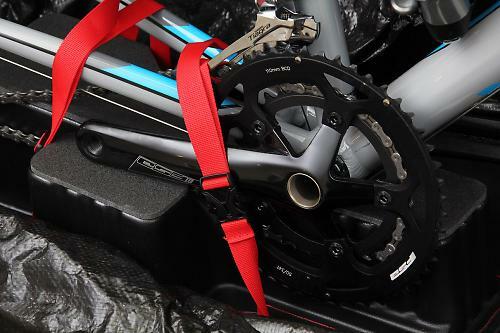 Hard cases offer (arguably) the best protection and robust locking, but also tend to be the most expensive, the heaviest, largest, and don't collapse any smaller when the bike is removed. Soft cases offer (again, arguably) less protection, can be got into with a sharp knife, but are also lighter, cheaper and can be compacted to a degree once the bike is removed. Which type of case is right for you is going to depend on a multitude of factors – budget, type and size of bike, storage needs in vehicles/at home, and security concerns. So does the Evoc offering fit your bill? 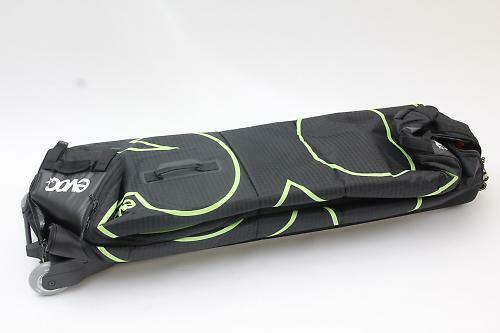 The Evoc Bike Travel Bag Pro is a handsome beast, available in black or fluoro lime. The case itself is easily assembled with four PVC tubes that reinforce the wheel pockets and four fibreglass sticks that strengthen each end of the case. 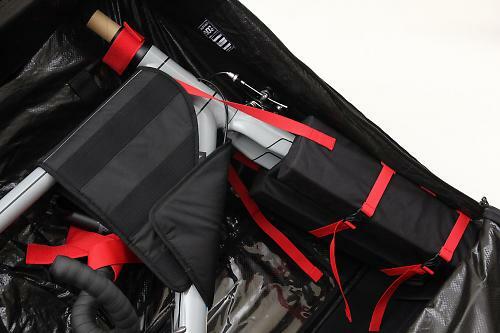 Inside are a number of Velcro and clip fittings that wrap around your bike and secure it to the inside of the case. 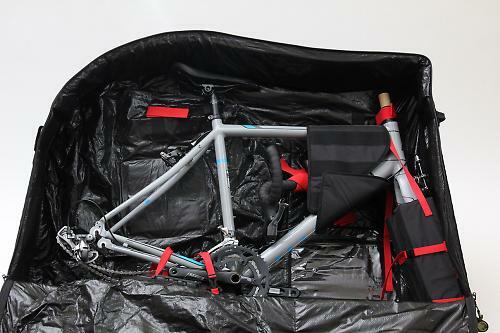 The case fits road and mountain bikes, with only the wheels, pedals and handlebar needing removing. There's a comprehensive yet simple illustrated step-by-step instruction manual. The case measures 130 x 80 x 36cm, wider at the wheels than Evoc's claimed 25cm. If you are seriously pushed for boot space or paying for shipping volumetrically, be aware that the real-word maximum dimensions make the overall volume 370L instead of the exact 280L. Empty, it folds down to 130 x 60 x 30cm. 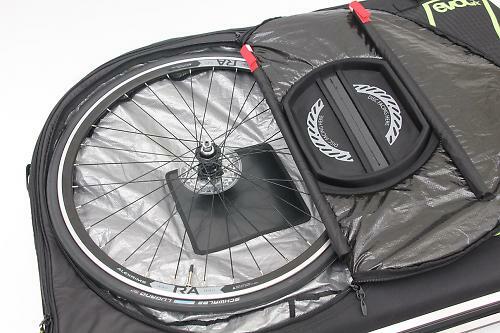 Evoc claim that at 8kg the Travel Bag Pro is the lightest bike case on the market. This means you'll need a pretty hefty 15kg of bike to tip over the common 23kg airline limit. Most road bikes hover around 8-10kg, leaving you 5-7kg worth of helmet/clothes/tools to stuff in and hopefully keep you within one-piece-plus-hand-luggage limits. The first time you use the bag it's best to put aside an hour or so for trial and error. The packing process is not hard, but there's method to the madness of achieving the best result – particularly regarding handlebar orientation and securing. Brake and shifter cables have to be carefully managed to avoid stressing any joins or creating kinks – especially if your bike has hydraulic disc brakes, and the potential of leaking fluid. And if you do have discs, invest in two disc spacers and some rubber bands - pop the spacers into your callipers and the rubber bands around your brake levers to hold them in place. You don't want to accidentally squeeze a lever on an empty calliper. 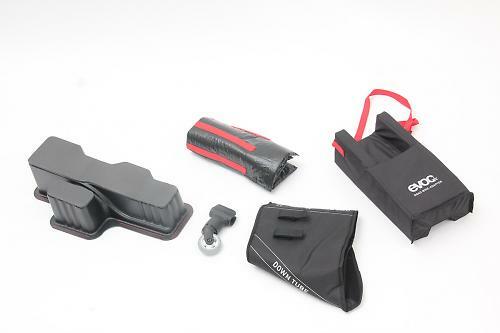 For road bikes Evoc provide a square padded sleeve for the fork to slide inside, which then clips into the case where a mountain bike's much thicker fork would go unadorned. The bottom bracket rests on a large 'block', which Velcros to the floor of the case and is movable depending on bike geometry. The block has a slot for the chain to run in back to the rear mech, which really should have a chain keeper/dummy hub fitted to keep things tidy (the Park DH-1 is very good, as is the Birzman Chain Spacer). It is always advisable to shift the derailleur inboard as far as it will go after removing the rear wheel (the Park/Birzman dummy hubs allow this), ditto shifting the chain onto the biggest chainring, to take up slack and offer some protection for hands and other kit you may stuff in the case. Some recommend unbolting the rear derailleur to avoid damage, but this isn't necessary as the rear of the Evoc case is the strongest, widest point; it's where the two trolley wheels are and it's protected both sides by the wheelset. Re-installing a derailleur bolt is one of the most fraught thing a non-mechanically-minded cyclist can do that doesn't involve bearings, so that this can be safely avoided is a big tick in the Evoc's favour. Evoc recommend dropping the saddle to its lowest height, the saddle then supporting the top of the case. But if you don't want to do this and risk scratching a lovely smooth seatpost against the collar or seat tube, an acceptable fit is possible with the seat down or removed. If you run an integrated seatpost you should carefully check the maximum dimensions. Pedals and wheel skewers go in the transparent internal zip-up pouch, then you remove the handlebar and secure it with two Velcro loops on the large wrap-around frame pad. Of course pay attention to your existing setup and mark the position (or take a photo). Secure your faceplate and bolts back in place (a good opportunity to clean and grease them). Two hold-down straps with clips go across the chainstays, or chainstay and bottlecage if your geometry dictates. Last thing to go in are the skewerless wheels, into dedicated side pockets with specially protected sections to keep disc rotors safe. Once you get the hang of it, a bike can be installed or removed in about 15 minutes. Just remember to pop the tools you need into the zip-up pouch, including a torque wrench for headset bolts. The Bike Travel Bag Pro fits in the back seat of a decent-sized car - try it in advance while empty. It has two handles on each side - one mid and one high - to aid lifting. At the front there's another handle near the top for pulling it along, and an aluminium bar at the bottom, which can be used as a handgrip with the bag tipped up at about 45 degrees when it then reduces the lifting required to about a third of the overall weight. The standout feature of the bag is the removable front castor wheel. This clips onto the aluminium handle so the bag sits level, allowing you to steer it in any direction with just your little finger in one of the three topmost handles. If you're juggling other luggage or kids it would be perfectly possible to use a short lanyard secured to your belt, wrist or other luggage to pull the bike along. It's difficult to overstate just how nice the experience is of waltzing down an airport or train station concourse, your 23kg 'check-me-out-I'm-a-cyclist-on-holiday' luggage following meekly behind. Once you get to a transit point where you need the bag to sit still or be thrown about, the wheel is easily unclipped and put into a specific external zip pocket. While the swivelling wheel worked perfectly at first, after a few walk/transport/walk episodes the two plastic studs that hold the wheel in a vertical position on the handle had worn to the extent that it occasionally came loose, pivoting around the handle and jamming on the case. When contacted, Evoc told us they had already spotted this problem and were working on a more solid solution with longer metal inserts. These “will be available as free spare part for all BTBPro customers in the future”, and the new version should be on bags in production now. With that problem sorted, the Evoc Travel Bag Pro makes a great travelling companion. Its light weight compared with hardshell options means you can avoid excess baggage fees on a quick trip to the Alps. As it folds down to roughly half its full size when empty you could easily put two or three into the boot of a car, which could make a multi-person trip simpler/cheaper/possible at all. Yes, at £400 it's only a shade off the price of the class-leading hardshell du jour, the BikeBoxAlan. But if you need collapsibility, an extra 3.2kg of kit allowance and more-than-good-enough protection, the Evoc Bike Travel Bag Pro is a great buy. Evoc do three accessories you might want - an adjustable aluminium stand specifically for a road bike's dropouts to speed fitting and aid stability (adds 1kg), wheel cases for extra protection (1.5kg the set), and a chain cover (120g) - useful to keep anything else in the bag clean. The heavy-duty zips are lockable with small padlocks (up to 4mm shackle diameter), or lock all three together at the top using a 4mm cable lock (always take a cable lock – so you can secure your bike case in luggage compartments on trains and so on). It's for anyone wanting to shift a bike, safely. Aimed at the regular travelling cyclist, who doesn't have a team bus or van to keep it in. EVOC say: 'Bike Travel 2.0 – it's lighter, it's sturdier and it's more comfortable thanks to new constructions such as the MONOCOQUE WHEEL CHASSIS, MOLDED BOTTOM CASE with ALUMINIUM SLIDE RAILS and ALUMINIUM FRONT HANDLE SYSTEM. Whether you want to pack your race, triathlon, XC, FR, DH or Enduro bike, it will only take a few minutes and all you have to remove are the handlebar, pedals and wheels. Convenient: includes ROAD BIKE ADAPTER, FRAME PAD and CLIP-ON WHEEL.' Can't disagree with EVOC - it is light, and the wheel is cool - make sure you get the free replacement. I would have given it 10, but that front wheel let the team down. Everything else is bombproof. Apart from that wheel that's getting re-worked, everything looks like it will last decades. Excellent when in its key USP – transiting transport terminals, using the front wheel. It follows with the slightest of tugs, then sits still. The overall vibe oozes quality and intelligent design. Not cheap, sure. But if it fits your use case, it's great value. It could save you £40-50 per flight in excess baggage charges. That's just five trips, and the bag looks like it will go a hundred times that. When you can drag 23kg by your little finger across miles of airport, it's comfortable. Yep. Excellent. Apart from the to-be-fixed wheel. Enjoyable to use. I really, really didn't want to mark it down. If the wheel worked as Evoc no doubt intended it to, I'd happily give it a 10. As it is, I'll give it a 9, with the caveat that they better pull finger and rectify the wheel design pronto. I'm sure they will. You know what I'm going to say... yep – the removable wheel. Take that out, and there's nothing to dislike. Best in class. Can't fault that. "And now that many airlines consider bikes acceptable luggage, you might not even have to pay any fee for flying with it." Really? Maybe long haul, but I've not found one in Europe which doesn't charge. Lufthansa claim they don't charge, but their hilarious rules mean unless you have a Brompton you will pay for it. Airlines have their own weight limits for Sports Equipment once you've paid. EasyJet is the best, 32kg for 35 quid each way. IIRC Monarch is 23kg, still enough for most road bikes but big DH mtb's in this bag get close. I've been admiring the evoc since version 1.0, but some reviews suggest that neither the design, nor the build is spot on. They cite single-stitching, flimsiness and the mass of the bike not sitting square on the wheels - something I guess is important when pulling your luggage. I've got the previous version and it is brilliant, but it needs one of its structural rods along the top as it tends to collapse a bit and it affects the stability of the bag. This is exactly what bothers me the most also. Perhaps EVOC is attending to this? I've got one of the previous versions, which full RRP is £100 less, and if you keep your eyes peeled you can get them for less. I think I paid about £210 for mine from Evans. The top can "sag" a bit, due to the lack of some form of support, but as said in this review you can set your saddle height to provide a level of support. Some might not want to do this - I have an integrated seat pin and have to remove the saddle to fit it in, but it's a minor niggle and overall its a great piece of kit. I've used in 10's of times over the past few years on trips to Europe and the best bit for me is how well the frame is held in place by the velcro straps, there's very little that can happen to the bike, and with the wheels forming part of the protection for the rear triangle/mech area I travel worry free. Clearly something could happen, but I've seen hard cases dropped and cracked , while this being soft means it has some give should this happen. It's not perfect though, I had to return the 1st one as the wheels were pointing about 20 degrees in opposite directions (I think it had been stored in a pile as the axle was bent. Also, if you buy the previous version it doesn't come with the road bike fork foam attachment thingy, which is another £15 or so, which is a bit cheeky when you've just forked out 200+ quid. Also, like this one, there's only really one inside pocket (the clear one behind the fork area), which is pretty tight and only really useful for pedals, skewers and a few tools. There's one more behind the rear triangle area, which is about the size of 2 coke cans, and one on the outside (bit bigger, but it's zip can't take a lock so you don't want to put much in there - the zip can annoyingly work its way open/the baggage handler had a look(!)). There's so much space inside this thing when your bike is in - I can zip tie a track pump to the seat stays no problem - but putting other things inside means you have to zip-tie or bungee bags/stuff in place, otherwise when you get to the other end of your trip they'll be guaranteed to be all over the show. Overall its great, tho I cant see a massive difference between this one and my one to justify the extra cash, apart from the disc brake thing in the wheel areas. If you dont have discs on your wheels I'd save my cash and buy the cheaper one. One last point - good luck ever getting it back as neatly folded as when you buy it (as shown in the pics) - it's like a tent, you can never quite get it packed away quite as well! I've not found one in Europe which doesn't charge. "We will accept non-motorised bicycles up to 190cm (75in) in length, provided they are packed in a recognised bicycle bag. deflate the tyres to reduce the risk of damage"
I loaded the bag to spot on the 23KG limit. The handling of the bag across sloping surfaces, cobbles, doorways, ramps etc was fine. The base of the bag is rock-solid. In terms of the build quality, apart from the mentioned castor wheel, I couldn't fault it. The EVOC bag paired with the recently-reviewed Seasucker roof mount just might be the perfect fly-drive combo. Wheel your bike to the hire car, pull the Seasucker out from the bag, bike on roof, bag folded into boot. If you scale the car to the number in your party, I reckon you could get two, three or four people plus bags on board. That would be an impossibility with a hard case. "We will accept non-motorised bicycles up to 190cm (75in) in length, provided they are packed in a recognised bicycle bag." Oh great, thanks for that link. I hoped with my comment I'd be proven incorrect. My Lufthansa comment is based on their rule that you can indeed take your instead of normal luggage (ie, you can take 1 piece in total), but the size of length+height+depth must be less than 158cm. This is basically a normal big suitcase size. I told them there was no bike you could fit into that size. The answer? A small bike would fit sir. A small bike would fit sir. Airnimal or S&S couplers start to make more sense if you fly with a bike a lot I guess. I totally agree with this. I've got my road bike on the aluminium frame and the seasucker mini-bomber I've got slides right underneath and you can strap it down. Perfect for hire-car getaways! Hooray! EVOC have just sent the new wheel with metal studs, Looks to be sorted. Well done. BA: http://www.britishairways.com/en-gb/information/baggage-essentials/sport... "We will accept non-motorised bicycles up to 190cm (75in) in length, provided they are packed in a recognised bicycle bag." I've got the Aerus BioSpeed bike travel case, which holds a full size bike and does fit within most airlines standard suitcase size. Alas, it doesn't have wheels, but its also 8kgs. I've flown with it a few times and everythings been fine, no issues at all. Not sure its still produced.